Join us for our NEW Tuesday night Trivia with Trivia Central starting at 7pm tonight at Massey Park. There will be lots of prizes and vouchers up for grabs as we are at golf club there will be a putting competition as well. 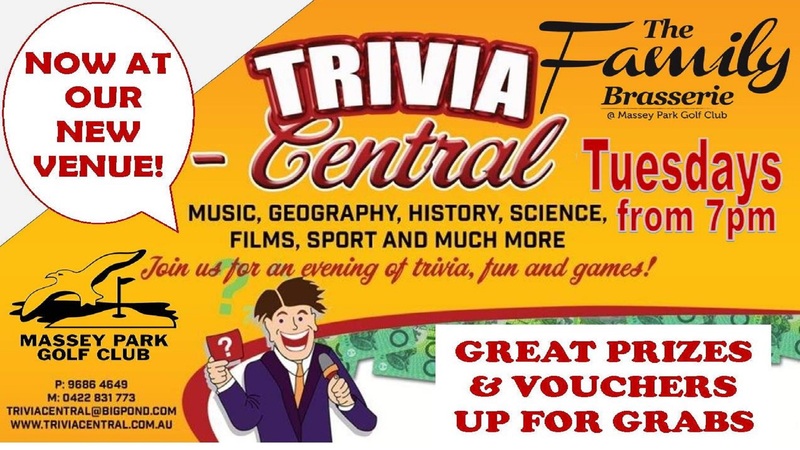 Happy Hour is from 4 – 6pm and The Family Brasserie will be open from 5.00pm so come down for a night of great food and entertainment with The Family Brasserie & Trivia Central NOW at Massey Park Golf Club. Take advantage of our New Social Membership promotion and receive $10 credit for your next meal at The Family Brasserie. Ask our friendly staff or pick up an application form from the bar.